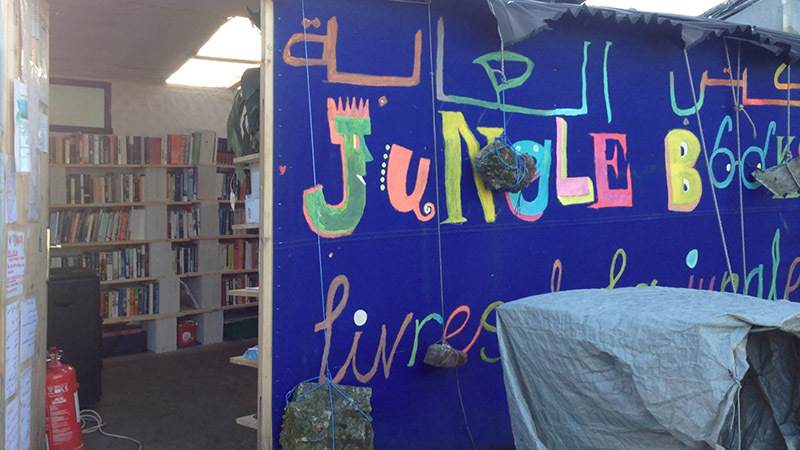 Last week, Right to Remain ran some ‘know your rights’ workshops in the Calais refugee camp known as the “jungle”. Calais is an historic port town on the Côte d’Opale, just 26 miles from the Kent coast, and the first thing any visitor will notice is miles and miles of high fences, topped with razor wire. It was a beautiful sunny winter’s morning when we arrived, jumping out of the back of a transit van and walking into the camp. 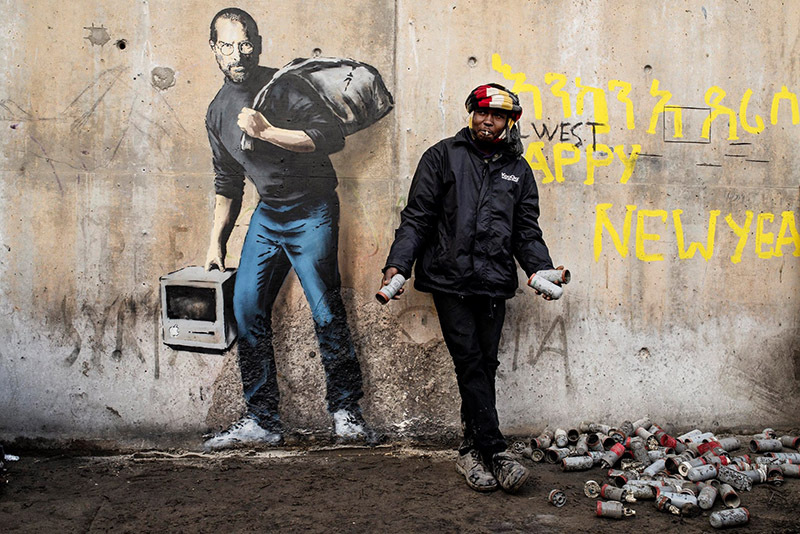 Under the watchful eyes of the police, we passed the new Banksy portrait of Steve Jobs, a rather successful son of a Syrian immigrant to the USA. Over the next two days, we met many Syrians, and other nationalities fleeing wars and persecution and crushing poverty, who are crying out for a chance to find sanctuary and an opportunity to restart their lives. When we travelled to Calais, we didn’t take a cargo of tents, sleeping bags, clothes, food or building materials. These essential supplies are being brought in and sorted out by some great organisations and hard-working volunteers, like our hosts, L’Auberge des Migrants and the Jungle Books Library. We brought a delivery of a different kind to share out – information, knowledge, skills and experience of the UK asylum system. We ran two workshops in the camp, for refugees and volunteers on what to expect of the UK legal process, rights and options in the system, how to prepare for the inevitable problems, how to avoid the mistakes that can lead to refugees being unfairly refused asylum, how to be active and involved in your asylum application, how to get the legal and other help that you need. 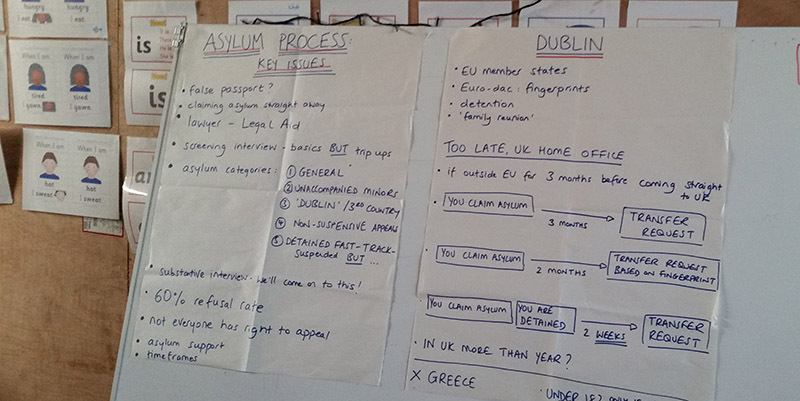 All of our workshops are based around the materials in our Toolkit – a comprehensive guide to the UK immigration and asylum system, a handbook on taking action for the right to remain. We are crowdfunding to raise £10,000 to produce a new, updated and expanded edition of the Toolkit, first published in 2013. In fact, having already raised over £6,000 this month, we have started to create the new materials, and Calais was the first workshop with them. This is fitting, as it was in Calais that the original Toolkit materials were first used in workshops, back in 2012/13. Sadly, since then, the situation in both Calais and the UK has worsened for people seeking refuge. But if the Toolkit is a guide to the UK system, why were we in Calais, France? The simple answer is that there are people in Calais seeking sanctuary from war and persecution, who want to apply for asylum in the UK. Our aim is to help people to understand and navigate a complex and hostile asylum process, and we know from years of experience that the more prepared an applicant is, the more likely they are to be able to establish their legal right to remain, by overcoming the barriers designed to deny them their rights. When we first started work to research and produce the Toolkit, back in 2010, we travelled all across the UK, consulting with our networks, meeting with dozens of community groups, speaking with hundreds of migrant support volunteers and workers, immigration lawyers, and refugees with experience of the system. One of the meetings has always stuck in my mind. It was in Bradford, Yorkshire, at a meeting we organised with BEACON, a well-established support network. We were discussing what they needed in the town, what we could do to help as a national coordinating organisation. A common problem was that too many people were unprepared for the obstacles ahead, and didn’t seek help until it was too late, mistakes had been made, legal deadlines missed and so on. The answer, we worked out, was to have something to offer that went beyond providing support to deal with the side-effects of this awful system. Too many refugees were being refused, failed by the legal system. We needed to deal with the cause of these system failures, not just the symptoms. Yes, people need emotional support, friendship, help with money, housing and other serious problems. But if people can progress their legal cases, they can get out of, or better still avoid, destitution, detention and deportation, and move on to finding sanctuary. The Toolkit project was developed with groups like BEACON, and many others, so that people could take control of their legal cases, and get practical help from community groups to establish their legal rights. Since that time, we have seen a global increase in forced displacement, and in the UK there have been cuts to Legal Aid, increased use of detention, and a hardening of immigration controls. This means, for refugees stuck at the borders, and for those who reach the UK, more hardship, more barriers to justice and a greater need for community help, and for resources like our Toolkit. One of the key aims of the whole Toolkit project is to get people involved and active in their own legal cases, and to get started as soon as possible – ideally before the “substantive interview”, but earlier if possible. In Bradford, the plan was to talk to people as soon as they were dispersed to the city by the Home Office. Our Calais workshops are taking it a step back n the process, to prepare people even earlier. Many refugees there, in those awful living conditions, experiencing police harassment and violence, assume that once they reach the UK they will be finally safe, just apply for asylum, explain their story, and wait for a decision. Sadly, this is far from the truth. Some workshop participants knew what lay ahead – many have family in the UK, which is the reason they need to get there. But for others, I could see the worry and doubts growing on their faces as we explained the process, the legal obstacles, the stressful, interrogation-like interviews where mistakes are made. They are right to worry, but with knowledge of rights and options, and some preparation and support, these obstacles can be overcome. Over the course of the workshops, around 75 people participated. The sessions are designed to promote knowledge-cascading: participants are encouraged to use the handouts to spread the information to others. At one of the workshops, there were two young Eritrean men, who had said their English wasn’t too good, but one of them took the words out of my mouth. I was explaining that by helping others, sometimes you can be helping yourself at the same time, and we sometimes call this – and a quiet voice said: mutual aid. No one is really sure how many people are living in the camps at Calais and nearby Dunkirk now, perhaps as many as 6,000. Compared to hundreds of thousands in the rest of Europe, or the millions displaced worldwide, it’s a relatively small number, but their needs are great. There are basic humanitarian needs in the camps which must be met. And there is a desperate need for political movement – these camps should not exist, there is no need for them, it is shameful that they exist, and the solution is simple: open the borders, allow people to apply for sanctuary in the country where they need to be. We need to work together to push for a solution based on justice, equality, human rights. Meanwhile, we all do what we can, and there is a lot of work to be done. 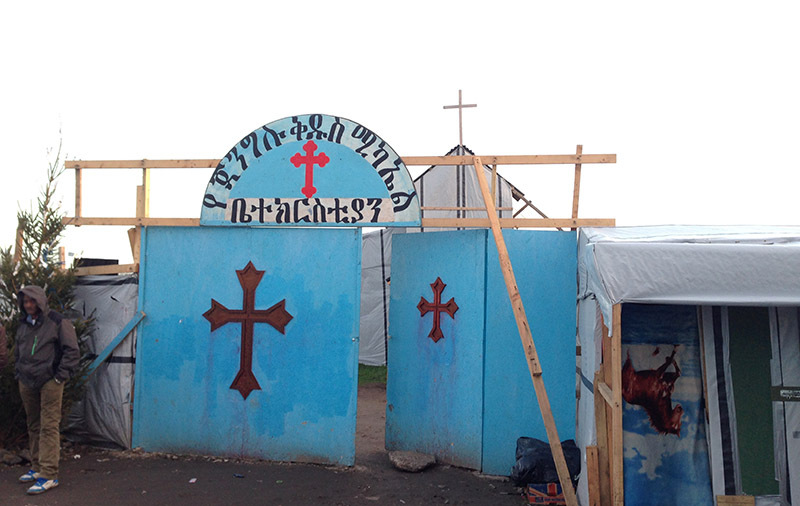 The volunteers at the camps with massive hearts and scarce resources are keeping people from freezing and starving. We want to help people to get out of that situation, and find sanctuary. To help with this, we are providing information, resources and workshops on the asylum system. One thing we really really need right now, to increase the impact of these workshops, is to publish the new, updated and expanded Right to Remain Toolkit. That way, workshop participants have online and printed resources to keep going back to. We are already in talks to return to Calais, and to build on these workshops with remote-learning online sessions for volunteers. Many thanks to the volunteers there, especially Sarah, who helped get this started. If you want to get involved at Calais and Dunkirk, the Calais – People to People Solidarity – Action from UK Facebook page is a good place to start. It has information on ways you can help, over there, or from the UK. If you want to get involved in supporting people seeking sanctuary in the UK, there are many local projects supporting people to get through the system, and campaigning for justice. Keep an eye on our Facebook and Twitter feeds, get in touch, or leave comments on here. If you can donate to the Toolkit fund, even just a few pounds, please do. If you can’t (and we know many of our readers have little or no money), you can support the initiative by sharing it, and asking people, groups, organisations, churches, mosques, trade unions etc to lend support.